Non-woven geotextile fabrics have a lower tensile strength than their woven counterpart it offers better drainage qualities with a good level of strength and durability. Non-woven geosynthetics are manufactured from a felt-like fabric made by thermally bonding polypropylene or a mixture of polypropylene and polyester fibres and then finishing using needle punching, calendering and other methods. Non-woven geotextile fabric is easier to cut, has high water permeability rate and does not lose strength over time, in the same way as woven fabric. This makes it ideal for use beneath driveways and roads, or land and stormwater drainage systems, where long-term ground stabilisation and filtration is required. 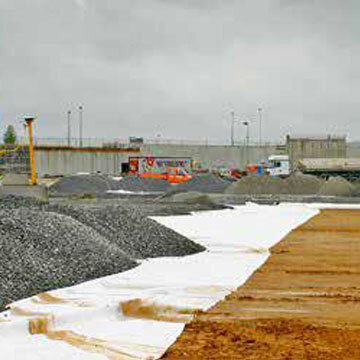 Our range of non-woven geotextile membranes includes Multitrack, superior non-woven and virgin non-woven ranges. Wrekin Multitrack NW – This range of thermally bonded non-woven geotextiles have been developed for separation and filtration in a wide range of groundworks applications. Manufactured using a unique thermal bonding process, our NW range has excellent filtration properties, making them ideal for use in a variety of construction applications. 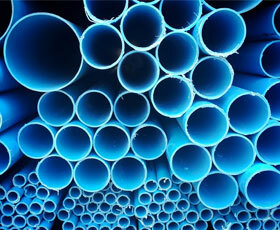 Examples would include trench drains, wrapping of attenuation units, wrapping of perforated drainage pipes, encapsulation of granular drainage blankets. Typical applications of this product include separating and strengthening layer under access roads & areas of hard-standing, filter surround for trench drains, separation to stop the intermixing of dissimilar soil layers and filtration, allowing the flow of water whilst preventing the passage of soil. Wrekin Multitrack SNW (Superior non-woven) – This range of geotextiles are manufactured by needle punching a web of high tenacity fibres to produce a consistent & uniform product of highest performance. Produced on state of the art computer-controlled production lines, available in weights from 120 to 800gsm. SNW products offer excellent puncture resistance properties combined with high permeability, properties that provide engineers with a versatile fabric ideally suited for the protection and/or separation/filtration functions. Typical applications of this product include protection Fleece for impermeable liners, SUDS, land fill sites, protecting coastal defences from erosion, pipeline protection fleece, river bank erosion control. Wrekin Multitrack VNW – This range of non-woven geotextiles are manufactured using multi-coloured staple virgin fibres, developing products of a medium performance. VNW products offer greater mass per unit area and are suited for use where a thick cushioning layer/high elongation are viewed as key design requirements. 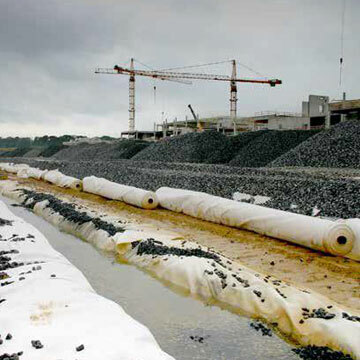 Typical applications of this product include protection Fleece for impermeable liners, SUDS, land fill sites, protecting coastal defences from erosion, pipeline protection fleece and river bank erosion control.